Word 1.15 is copy protected. The original 1.00 apparently let you make backups using an included backup utility, but 1.15 includes a backup floppy and removes the ability to make further backups. 1.15 lets you install to a hard drive - but only ONCE. The installer writes back to the disk to prevent you from doing it again. If the hard drive crashes and you didn't have a full backup then you had to buy a new copy of Word! Well, its nice to know that Microsoft have been dickheads since the beginning. So lets take a closer look at the "protection". It uses an interesting scheme of 12 256-byte sectors at the end of the disk. One of these sectors is given an ID that incorrectly says it is a 1024 byte sector. PC disk controllers can format such a track, but attempts to read the sector will fail. Running the executable from the floppy also depends on finding certain information on this track. So what is in there? Copyright 1983 Microsoft Corporation. Tens of thousands of man-hours have been spent to make this product possible, so that you, the user, can use high quality programs. If you steal this software, then we will not receive the fruits of our labor. le can use. If criminals stop stealing our software, then we wibe able to write more programs, make them more advanced, and sell them at a lower price. Think about it. We will prosecute anyone we find stealing our software. If you are caught, it is unlikely that you will ever be able to get a job with any company in this field. Don't risk it. If you are not honest, we will not have mercy on you. And finally, Microsoft Word shutting YOU down! Word displays this message if it thinks it detects a debugger running. 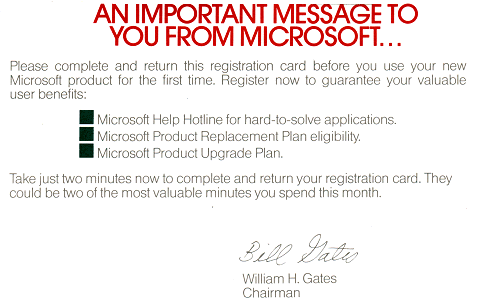 Reportedly this was also present in other Microsoft tools of the time period (Multiplan, Access Communications, etc). Interestingly, it actually displays this on one of my computers! With all this kind of crap, it makes one wonder what kind of other nasty code might be inside this program. In the late 80s and 90s most software vendors stopped using this kind of copy protection because it was not guaranteed to be compatible with all IBM PC clones, more software was run only from hard drives, and users often needed to move the program between 360K, 720K, 1.2mb, and 1.44mb formats at will. It was also enough of a support problem, that it sometimes forced users to turn to competitors (remember when we used to have competition?). In summary, Word for DOS is really a text-mode application with mouse support shoehorned in. It ran in graphical mode just so Microsoft could advertise it as a "WYSIWYG" environment and give their new mouse something to click on.